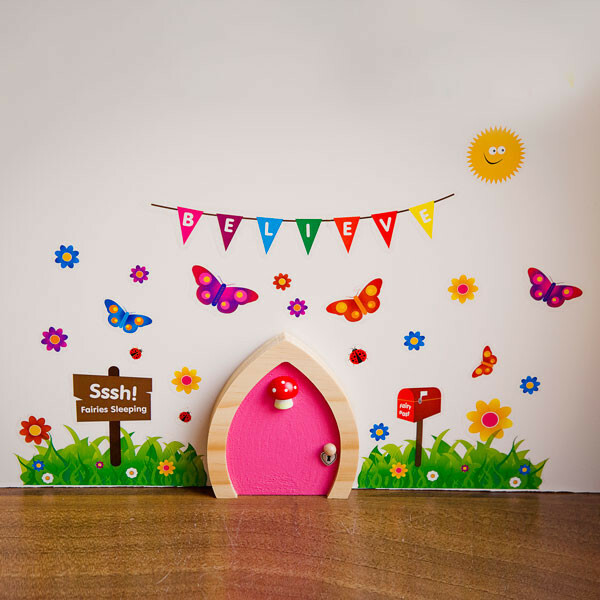 I absolutely love these Fairy Doors, put them inside our outside and invite a fairy to come and live with you. 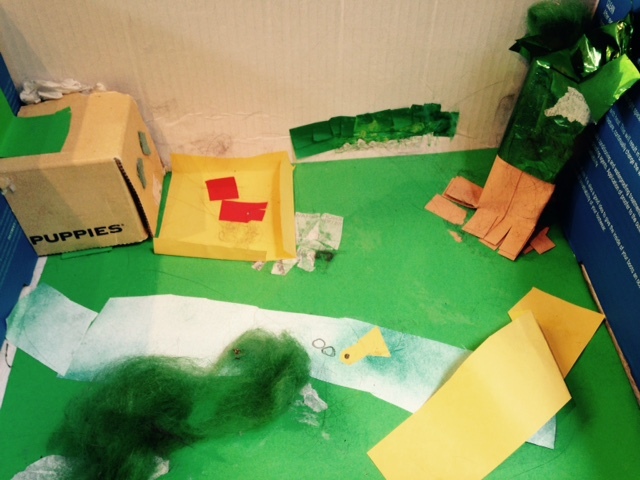 I’m all up for anything that stimulates imagination, encourages creative play and promotes writing. I’ve just survived the school holidays and was nearly broken by the repeated pleas asking ‘what are we doing today? Who are we going to visit?’ My 7 year old daughter, an only child, has never been brilliant at playing on her own and a simple ‘go and play’ doesn’t work. 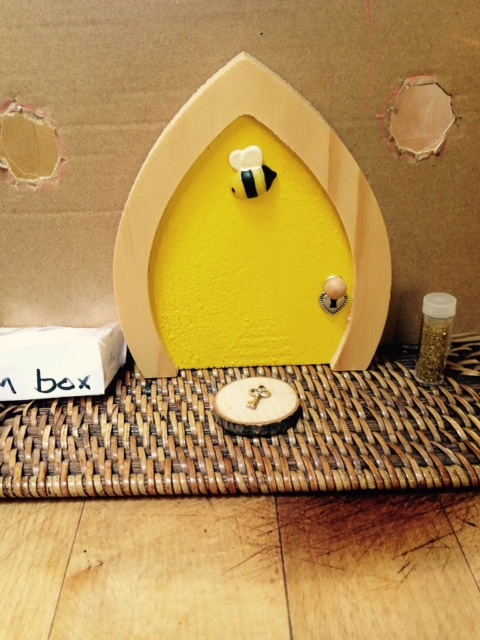 However, the morning after our ‘Own Fairy Door’ arrived she set upon opening and became totally immersed in creating a home for her Fairy. She spent a good two to three hours playing independently with very little input from us. Now we just need to wait for her to move in. Apparently, once the key is gone and there’s fairy dust on the doorstep we will know she’s arrived. We will then need to go online and print off her a naming certificate for her. These would make excellent gifts for some of her school friends and reasonable priced at £19.99. 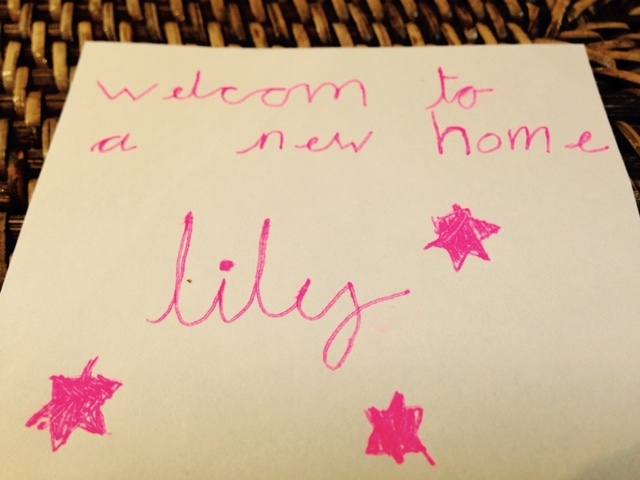 Author mediocremumPosted on 01/06/2015 01/06/2015 Categories Education, Kid's Crafts, Kid's Entertainment, Product ReviewsTags creative writing, fairy door, imaginative play1 Comment on Could you give a REAL Fairy a Home? I have mixed feelings about Christmas Cards. On one hand I love hearing from old friends, but they quickly begin to take over all the surfaces in the house. This year with a bit of blue tac I managed to keep on top of them. 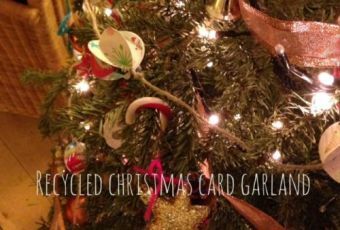 Shortly after Christmas, that urge to de-Christmas my house set in, but what do you do with all the old cards? There are local schemes that recycle them for you, but as we had a few more days off school, I was looking for an activity to entertain my 7 year old. 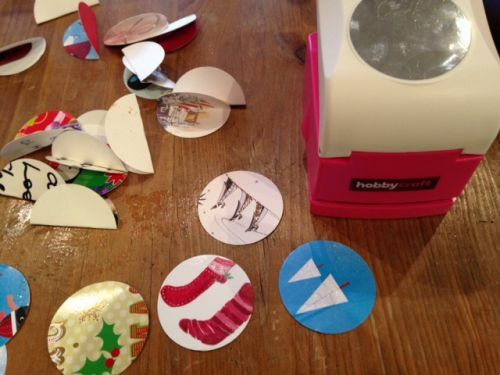 Over the years we have made Mosaic Placemats with them, Thank you cards and Christmas tags. I had a quick look on Pinterest and came across an idea from Party Planning Center for creating Christmas Garland with them. I have a personal hatred of the store bought shiny garland so this was a perfect solution and it was relatively easy. 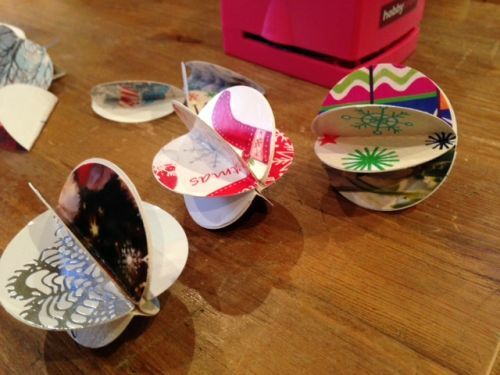 The most difficult part was locating a 2″ Circular Craft Punch, like any other time we decide to craft it always results in a trip to the shops as we aren’t well stocked in the craft department. I managed to find one at Hobbycraft. I think they’re fairly self explanatory but the full instructions can be found at the link below. 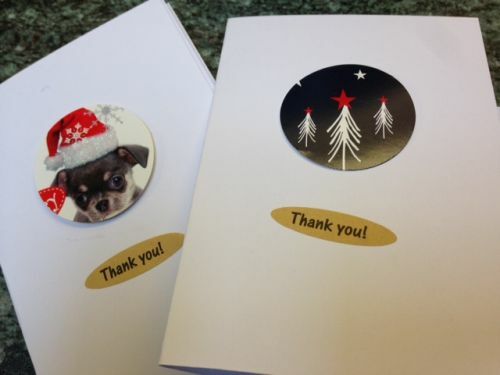 Now that we have the circular punch, we thought we’d do a few Thank you cards while we were at it. 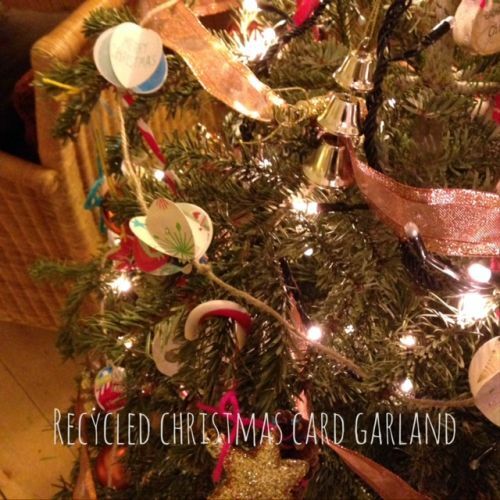 What do you do with all your old Christmas Cards? Do you have any other craft activities I can use my punch for? 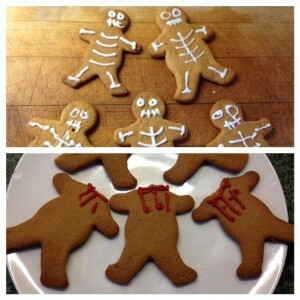 We were just baking some Halloween Biscuits? It such a shame that as adults we lose our sense of innocence as we’re sharpened by experience and shaped by reality. I was baking with my daughter this afternoon, a sure sign that Half-term has broken me, as I find baking incredibly stressful. Like any good mum, we hit Google images (filtered of course) and found some Halloween themed biscuits AKA cookies that looked easy enough. We were happily attacking one of those just add water baking kits, when it all of a sudden dawned on me I wouldn’t be able to post pictures of them online. It would come across brash and incentive with recent news reports. 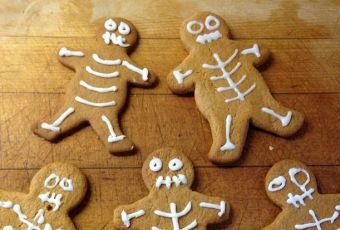 If you’re wondering, we made headless gingerbread men and skeletons. How could I be so intensive with the recent IS attacks and yes, I did guiltily think about the reference to eating disorders! Insane! Luckily, I had a friend reeled me back in and reminded me that for my 7 year old it was just baking and she’s oblivious to the IS beheadings. ‘Hey, she’s just a child and she doesn’t need to be aware – she’s happy doing her baking and that’s what childhood should be about’. I’ve decided that I would rather live my life through the eyes of a child. How to Train Your Dragon 2 – Tears and laughter! At what age do children show empathy? To give myself a bit of a break on the weekend, I’d checked the weather report and it looked grim, so I booked my daughter and hubby into the Cinema to see How to Train Your Dragon 2. She’d watched the first one and has also watched How to Train Your Dragon Legends on Netflix along with countless other kids films on there. My husband came home and raved about it, saying it was just as good if not better than the first. He said she was sitting on the edge of her seat most of the time smiling, totally taken by the story. However, I don’t want to spoil it for you, but there was a part that made her cry, apparently someone dies but I’m not going to tell you who. It sounds like the writers have taken it to a deeper darker level, maybe they realise the children who watched the original in 2010 have grown up a bit. As I haven’t seen it, do you think it’s too dark for littlies? Personally, I think it’s a sign of a good movie if it can make you laugh, cry or think. With School Holidays looming, I’m doing my usual panic of things to do, especially if it rains. I’ve been trolling the net looking for Dragon Activities and was inspired by the movie How to Train a Dragon 2 and it’s characters. Teach her how to get rid of hiccups by drinking a glass of water upside down. I’ve done this for years and it really does work. How to Train Your Dragon Jokes – my daughter is really into jokes at the moment. We may sit down and create our own Joke Books and see if we can make Toothless Laugh. 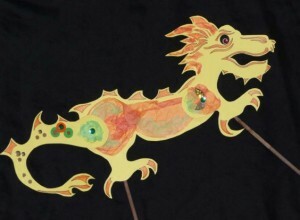 We hope to do a fair amount of camping this summer and shadow puppets are genius at night in the tent with a torch. 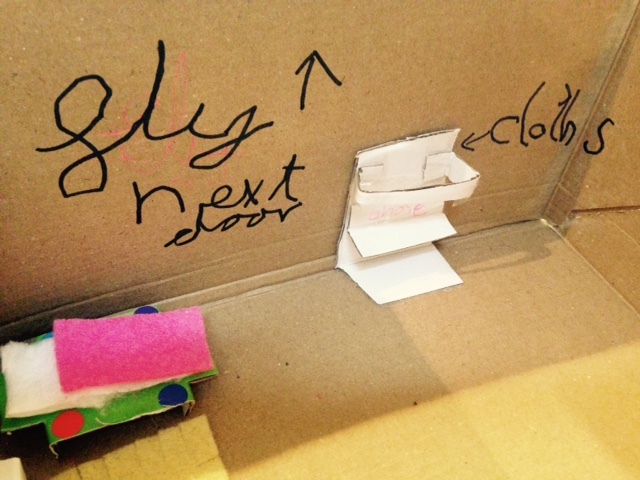 You can find instructions and a template for making your own at the British Museum. If we can get a few of her friends around I love the idea of playing Dragon Tag. It requires to teams, children form a human chain, with a scarf as a tail and try to steal each other’s tails. Chains can’t become separated. I may take the opportunity to introduce her to one of my all time favourites ‘Puff the Magic Dragon’ by Peter, Paul and Mary. 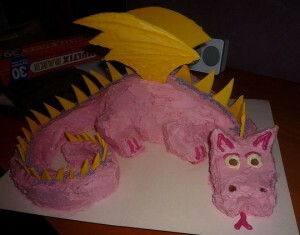 Personally I think this one would push me over the edge, but if we’re really desperate we could have a go at making this Dragon Cake. I’ve never been to one but I’d love to check out a Dragon Boat Festival. Author mediocremumPosted on 07/07/2014 Categories Cooking with Kids, Days Out, Kid's Crafts, Kid's Entertainment, Kids ActivitiesTags activities, crafts, review, train dragonLeave a comment on How to Train Your Dragon 2 – Tears and laughter! 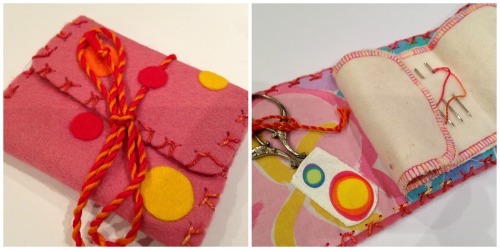 How to teach your kids how to sew…. My 6 year old daughter has really taken to sewing. This is definitely not something that she got from me. I can sew a button on, took home economics in high-school but would be more likely to throw something out before I mended it. The last time I tried to wind a bobbin I nearly blew the motor in the sewing machine. My grandmother was a very competent seamstress and always promised to make my wedding dress for me. However, I took too long getting to the alter and she had passed away by then. One of my cousins is also good at sewing but this seems to passed me by. However, we are blessed that one of my lovely neighbours Eva from Sticky Fingers Stuff is an avid stitcher and all things crafty really and been kind enough to take time out to teach Madame how to sew. She even has a special ‘sewing room’ which is packed with bits and bobs, everything you could imagine. They started with some simple stitches. Apparently the stitches even have names but don’t ask me…. And now have moved onto more complex projects. There was a bit of ‘adult’ prep behind the scenes beforehand. I think the most touching thing is the scissors that you can see. They were Eva’s Grandmother who had a love of sewing and she has now passed them down to our daughter who is developing a love of sewing. 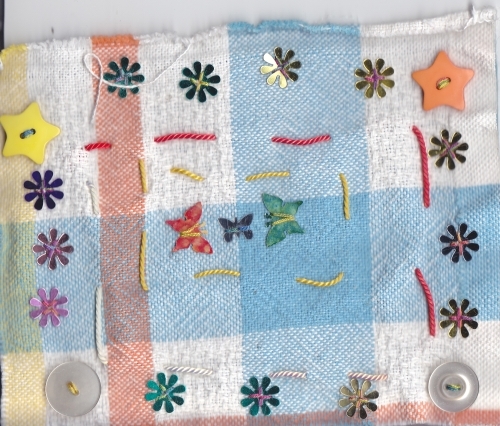 Eva has also pointed me in the direction of The Junior Embroiderers and Textile Students website for young people who are interested in stitching for fun or as a creative art. I can’t wait to see what they get up to next. We can’t thank you enough Eva. Author mediocremumPosted on 03/01/2014 02/01/2014 Categories Kid's CraftsTags kids, projects, sewing, stitching, teaching2 Comments on How to teach your kids how to sew….